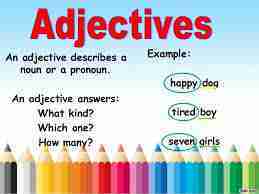 Learn English > English lessons and exercises > English test #115908: Adjectives: Where to put them? 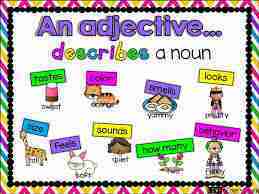 Adjectives: Where to put them? I) Nature and Place of ADJECTIVES: in English, ALL ADJECTIVES REMAIN INVARIABLE in the plural. A. Attributive adjectives are placed before the substantive, even if there are several of them, in the singular and the plural. · - a big red ball=> big red balls. B. 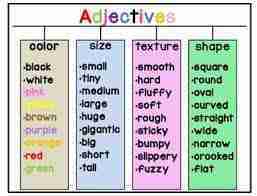 Some adjectives are always subject complements (or predicate adjectives). They are placed after some verbs, like to BE. These adjectives are : alive, asleep, afraid, awake, cross, ill, glad etc. The same adjectives may often be used BOTH with an active meaning: " noun+ ing", AND with a passive meaning (the action is done! ): "noun+ ed". In this case, it's very important not to mix them up, and to take care of your endings! If you're not careful, you may end up saying an ambiguous sentence or the exact opposite of what you were meaning to say. - I don't think what you're saying is interesting... in fact, I'm bored and tired of listening to you. Size (form, dimension), Age (new, young, old), Colour, Origin (nationality, religion, geographical or political origin), Material. - Gatsby's big, brand-new, yellow car was extraordinary. - An amazing tiny beige Turkish leather bag. - Daisy was a beautiful, young, fair-haired and grey-eyed woman. - a stupid old man. - a strange thin little boy. Well well! Here's the test. Even if I tried to make it interesting, you may find it boring and tiring and be bored and tired when finishing! Disturbing, isn' it? 1. Pamela has got beautiful long curly blacka long black beautiful curlycurly black beautiful longI don't know hair. I hope she won't have it cut. 2. GrandMa took down a heavy old blue cardboardcardboard blue heavy oldold heavy blue cardboardI don't know box from the attic and I saw some of my Mom's toys. 3. Trevor was wearing an old-fashioned long blacka black old fashioned longa long black old-fashionI don't know overcoat. He looked like a PI (Private Investigator). 4. Paul was so exitingexciteexcitedexcitingI don't know when telling his travel stories that they were extremely interestinginterrestinginteressantinterrestedI don't know to listen to. 5. I had never seen this good-lookinglooked goodlooking goodgood lookedI don't know famous American actor and I was terribly astonishedterribly astonishingastonished terriblyI don't know when I noticed he was so small and plain. 6. When I arrived at Tom's home, he still was asleepwas still asleepwas sleeping stillI don't know , and I had to wait for him. 7. When I finally passed my driving licence, my parents bought a little blue cheapblue little cheapcheap little blueI don't know car for me to go to work. 8. At the flea market, I've found a lovely old SpanishSpanish old lovelyold Spanish lovelyI don't know table. 9. In my opinion, this is a long useless boredbored useless longlong useless boringI don't know exercise, and I don't want to do it. 10. Here is a second-hand Irish interestingan interrested second Irish handan interesting second-hand IrishI don't know novel by Joyce and I love it. End of the free exercise to learn English: Adjectives: Where to put them?